Spring has sprung! The weather is beautiful and it’s time to get outside! Many of us love the beach, but sometimes it’s fun to have other outdoor options to switch things up. Here are 15 outdoor activities to do within two hours of Destin! For only a $4 fee per vehicle, you can enjoy a day at the springs with your friends or family. Ponce De Leon Springs is absolutely beautiful and while it’s cold, it’s a wonderful outdoor experience. 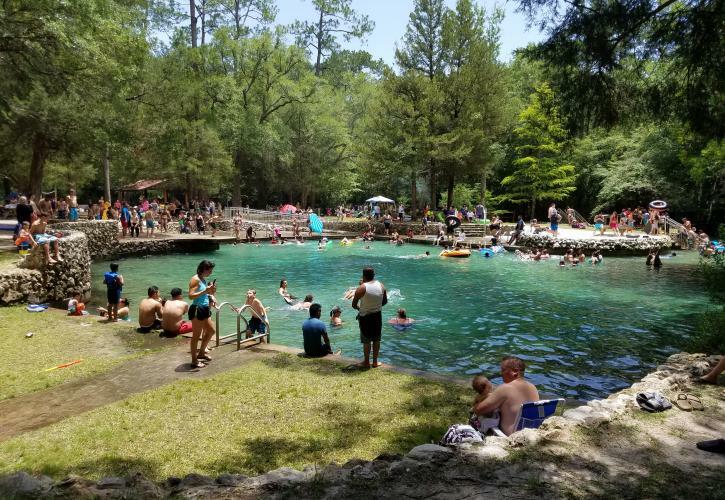 The water stays at 68 degrees all year long and you can enjoy swimming in the springs or take a nature walk along one of the trails. The Turkey Creek Park in Niceville is a fun outdoorsy activity for the whole family… and it’s free! There’s a boardwalk with a few different platforms to jump off of and swim in the creek. You could even carry a tube down to the last platform and float all the way down! Whether you want to experience ziplining, canoeing, kayaking, or tubing, Adventures Unlimited in Milton has you covered! The ziplining courses are only $89 per person and the other adventures are even less. They also have cabins available for rent if you wanted to make a weekend trip out of it! What could possibly be more “spring-y” than going to the Farmers Market on a beautiful weekend? Check out our Guide to Farmers Markets in the area! This one is fun! There are so many great places to stop along 30 A. If you have your own bikes, park anywhere you like (where it’s legal to park of course!) and ride down 30A, stopping anywhere that grabs your attention! There are also several places to rent bikes from if you don’t have your own. You can rent one for about $20-$30 a day! Fort Pickens dates back to the 1820s when it was designed and constructed to defend Pensacola Bay and the Pensacola Navy Yard and Depot from foreign attack. Exploring the fort is a great outdoor activity for the whole family. It’s $20 to park at Fort Pickens, but if you have a military ID, you get in for free! The Blue Wahoos are a Minor League Baseball Team out of Pensacola and if you haven’t gone to one of their games, you need to! It is definitely an experience and such a good time. The tickets are only $15. You can’t beat that! The Track in Destin is fun for all ages, but the go-kart track is especially fun for the older kids (and adults )! The Track also offers many other attractions including an arcade, mini golf, bumper boats and bumper cars. Western Pleasure Riding Stable in Santa Rosa Beach offers horseback rides through nature led by a knowledgeable tour guide. These guides will teach you how to safely ride a horse and give you a charming experience a throughout this nature ride! Just Chute Me was voted Best Parasail Operator Worldwide! That being said, if I were to ever try parasailing, that’s who I’d choose! They will take you up to 400 feet in the air and show you a breathtaking view of our beautiful Emerald Coast. It’s only $50 to parasail with Just Chute Me in Destin. You can learn to kitesurf in Fort Walton Beach with Emerald Coast Kitesurfing Lessons! The session is $300 and all gear is provided. If kitesurfing is something you want to do in the future, it may be worth the investment! Sup Rentals provides paddleboard rentals for as low as $45 for a half day! They will deliver to Destin, Fort Walton Beach and Okaloosa Island. How fun would it be to paddle out to Crab Island (and also track down Wild Coconuts while you’re out there便)? Additionally, Sup Rentals carries kayaks and will deliver to any of the beautiful national parks in the area. The Blackwater River is the ONLY pristine sand river left in the United States and makes for a wonderful outdoor experience. Blackwater Canoe Rental is located in Milton and has kayaks, canoes, and tubes available for rent! Prices range from $18-$30. The Treetop Adventure at Wild Willy’s Adventure Zone is only $15 per person and is fun (and terrifying) for all ages. They also offer several other fun attractions including goofy golf, go-karts, bumper boats, and other activities inside. How fun would it be to take your little ones (or yourself ) to pick fresh berries? Luckily, we have a few places to pick berries around here and Brooks Farm in Baker is one of them. You can pick strawberries by the pound for $1.85 per pound, a flat for $24 or half of a flat for $14. Follow their Facebook page for updates on when they are open! Are you ready to get outside yet? The weather has been beautiful and there’s no better time than now to get out and soak up some sun!